Eyeglass lens options have grown incredibly in the last several decades. 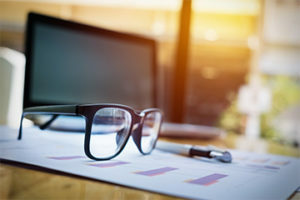 Whereas early eyeglass lenses were made from glass, advancements in lens materials have made them safer, thinner, lighter, and featuring benefits that early inventors never could have imagined! Glass lenses revolutionized so many aspects of life for people of that time. Glass can provide crisp, clear views, but it is heavy and breakable. It was not uncommon for lenses to break on impact, which could cause someone to lose sight or lose the eye entirely. For that reason, glass is rarely used for eyeglasses today. In the 1940s, plastic lenses were introduced. Armorlite Lens Company created a lightweight plastic lens made of plastic polymer. It was light, weighing about half as much as a glass lens, and was inexpensive. These plastic lenses were a hit, and are still a common option for eyeglasses today. Polycarbonate lenses were introduced in the 1970s. Polycarbonate is a highly durable polymer that is impact-resistant, but can scratch. For this reason, the lenses are recommended for children and used in most eyeglasses, but have the addition of a hard coating to deliver greater scratch resistance. High-index lenses are another lens option that many people aren’t aware of when they begin shopping for eyeglasses. High-index plastic materials make lenses thinner and lighter for people who have a strong prescription. Instead of thick lenses that used to give people fewer options for lenses and make their eyes look distorted from the front, high-index lenses can pack a stronger prescription into a thinner space. This opens more frame options and takes the weight off of your glasses if you have a high prescription! In addition to lens materials, there are a number of other features that you can add to your lenses for various functionality. For instance, anti-reflective or non-glare treatments are one of the most common upgrades. Often they give added scratch-resistance as well as cutting glares and giving a clearer view of your eyes from the front. Tints are another option you can add to your lenses. For sunglasses, wearers might choose around an 85% tint, but lighter options exist, too. Many lenses can be tinted gray, brown, or yellow. Fashion tints come in rose, blue, green, or even more possibilities. Polarization is a great addition for sunglass lenses, too, because it filters the bright glares that can be uncomfortable, even with sunglass tints. 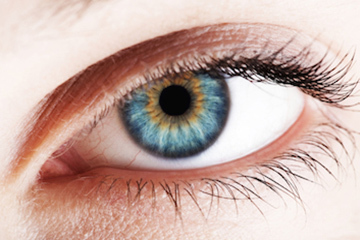 If you have any questions about the best lenses for your eyes, speak with an optician. They are trained in eyecare products and can assist you with these choices, as well as helping you pick frames that look great on you! Knowing what it takes to maintain healthy vision is important. As leading eye health providers, we regularly blog to educate our patients about eye care and eyewear.